The second machine shown on the Hanriot stand is an all-metal chaser, single-seater, with 260 h.p. Salmson engine, type Cu. Z. 9. The machine is shown in skeleton, ДальшеMore>>> so that the detail construction can be thoroughly inspected. With the exception of a few fittings of steel, the Hanriot "H.26" is built entirely of Duralumin, this metal being used mostly in the form of channel-sections. The fuselage is constructed of four main channel-section Duralumin longerons, formed into a Warren girder by channel-section struts which entirely triangulate the structure. The longerons have their open sides facing towards one another, as regards the side panels. Thus, the struts of the sides fit into the channels top and bottom, while the horizontal struts are attached to the longerons by gusset plates and rivets. The main structure is of rectangular section, turned into a streamline shape by light channel-section stringers and formers, built on to the main structure as indicated in our sketches. Also built entirely of Duralumin are the wings, of which the lower is quite small, the machine belonging to the "sesquiplan" type, now so popular in France. The wings are remarkable for the fact that they have but a single spar, although tubular leading edges and false rear spars assist materially in stiffening the structure. Light channel-section stringers and diagonal members serve to brace the wing structure, there being no internal drag bracing of the usual type. It appears probable that this form of bracing has been chosen in order to attain, at the same time as providing the drag bracing, a certain amount of stiffening against torsion, the single spars being probably somewhat inadequate in this respect. In the case of the lower wing, the single main spar is in the form of a Duralumin tube of rectangular section, with, of course, the corners rounded-off. The tubular leading edge is attached to the long strut of the undercarriage and to the lower longerons, while the false rear spar, also a Duralumin tube, is supported from the lower longerons. All the main attachments of these spars to chassis or longerons are in the form of sheet steel fittings, some of which are of somewhat complicated shape, but all of which appear extremely well-made, and, like the rest of the machine, beautifully finished. The lower main spar is attached, also by a sheet steel fitting, to lower longeron and the junction of two of the undercarriage struts with the fuselage. The upper plane, which is of much larger span and chord than the lower, is of similar construction, with the exception that the main spar, placed fairly far aft in the Schoukowsky aerofoil, is not a one-piece Duralumin tube, but is built-up of sides stamped out to form an N-girder, riveted to flat top and bottom flanges. In stamping-out the lightening pieces of the spar sides, these are given a slight curvature, so that the "legs" of each "N" are in section like a very shallow trough. Each side of a spar appears to be in one piece, stamped out of a single strip of Duralumin. The ribs of both top and bottom plane are built up in the form of a Warren girder, the material used being light Duralumin of channel-section. Ailerons are fitted to top plane only, and are operated by a system of tubes, chains and sprockets. The leading edge of the aileron is a rectangular section Duralumin tube. 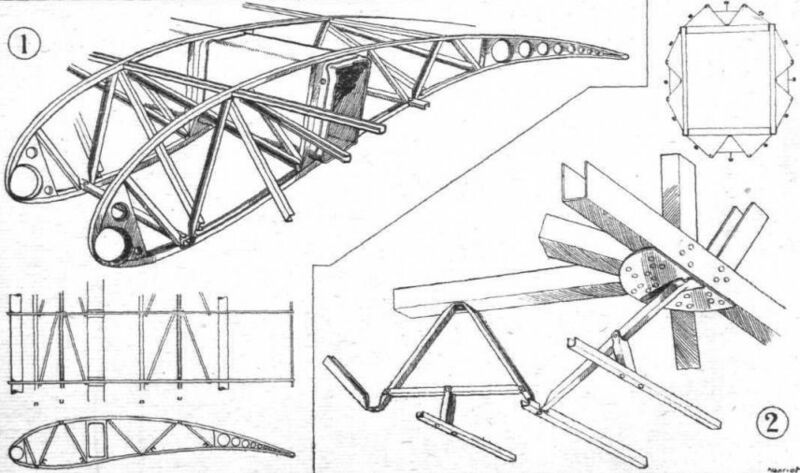 The wing bracing of the Hanriot "H.26" is unusual, inasmuch as it does not incorporate any struts, although the wings are not entirely cantilever beams on account of a single lift wire, running from the rear strut of the undercarriage to the top plane, passing en route to a fitting over the lower plane main spar. Both this fitting and the corresponding one on the top plane are of sheet metal: It is stated that the factor of safety on the wings is 12, loaded in the normal way. As regards torsional stresses and down loads such as may occur during a nose drive, the factor of safety may be considerably smaller, although this form of construction, with but single spars, has been used on the Hanriot "H.D.15" with, so far as we are aware, good results. That machine had, however, interplane struts to assist in resisting torsional stresses. To a certain extent, the fact that leading edge and false rear spar are secured to the fuselage should help matters, although, in view of the relatively small width of the fuselage, these points lie fairly close together and a long way from the wing tips. In pure bending, there is little doubt that the wings are amply strong, and it appears probable that the figure 12, given as the factor of safety, relates to pure bending only. The undercarriage, also a Duralumin structure, is of somewhat unusual design, inasmuch as there is a set of struts forming a letter N in side view, linking the lower portion of the undercarriage to the fuselage. These "N's," however, are reinforced by a single strut on each side, running from the shock-absorber attachments to the main spar of the top plane, at the point where this is attached to the fuselage. It will thus be seen that the long single struts do not lie in the same plane as that of the "N" struts, and a form of triangulation, as seen in front view, is obtained. This accounts for the fact that there is no transverse wire bracing in the undercarriage. A small wing section encloses the transverse tubes and axle of the chassis. The axle does not run right through, but is divided, a short length of fixed tube resting inside the fairing, with two short axles hinged to its ends. From the axle hinges wires run to the fuselage fitting on the lower longeron, at the point where the lower plane front spar is attached. Whatever one may think of the design of the Hanriot "H.26," especially as regards its wing structure, the workmanship is excellent, and the finish, made complete by some form of spraying with metal, above even the high average French standard. The main characteristics of the Hanriot "H.26" are :- Length o.a., 7-35 ms. (24 ft. 2 ins. ); span, 9 ms. (29 ft. 6 ins. ); height, 2-5 ms. (8 ft. 3 ins. ); wing area, 18 sq. ms. (194 sq. ft.); weight, empty, 820 kgs. (1,800 lbs. ); weight of fuel (3 hrs. ), 180 kgs. (396 lbs. ); useful load, 80 kgs. (176 lbs. ); total loaded weight, 1,080 kgs. (2,372 lbs. ); power loading, 9-14 lb./h.p. ; wing loading, 12-25 lb./sq. ft. Estimated performance: Maximum speed near ground, 260 kms. (161 miles) per hour; speed at 2,000 ms. 255 kms. (158 miles) per hour; ceiling, 8,500 ms. (28,000 ft.). THE Hanriot H-D-26 is a single-seater chaser of all-metal construction, with the wings so disposed as to give the best possible range of vision for the pilot. Since this machine first made its appearance at the last Paris Aero Show in 1922 certain modifications have been introduced, principally in the construction of the main plane and the wing construction. It is of the “Sesquiplane" semi-cantilever type, fitted with a 260 h.p. Salmson-type Z-9 engine. The upper plane, which is of thick section (Gottingen 430 ? ), is in two units, mounted on the top longerons of the fuselage. It has two main spars of rectangular-section duralumin, and a false tubular spar on which the ailerons are mounted. Originally the wing had a single rectangular spar and two auxiliary tubular spars, one of which formed the leading edge. The ribs have also been modified, being of armoured-wood construction. The small lower plane is also in two parts, and is attached to the lower longerons of the fuselage. It is built up of a single rectangular-section main spar and two tubular members, one located at the leading, and the other near the trailing, edge. One of the main features of the wing arrangement in the latest model Hanriot H-D-26 is the entire absence of wire bracing. In the original model a single-lift cable ran from the rear strut of the under-carriage to the top plane at a slight outward angle, and in addition there was a single strut extending upwards from the axle of the under-carriage to the centre portion of the top plane. In the new model, however, a single strut takes the place of the lift cable. The tail surfaces are built up of duralumin in a similar manner to the wings. Rudder and elevators are unbalanced. The fuselage is built up of four main longerons of channel-section duralumin, braced by channel-section cross and side members, Warren fashion. Light channel-section formers and stringers give the fuselage a streamline section. The landing chassis is of the V-type with the addition of a strut each side extending upwards from the axle and attached to the front spar of the lower plane and to the top-plane attachment fitting. The V's are attached to the engine mounting and to the lower longerons of the fuselage. A small lifting plane, fairing the axle, is mounted between the V's. 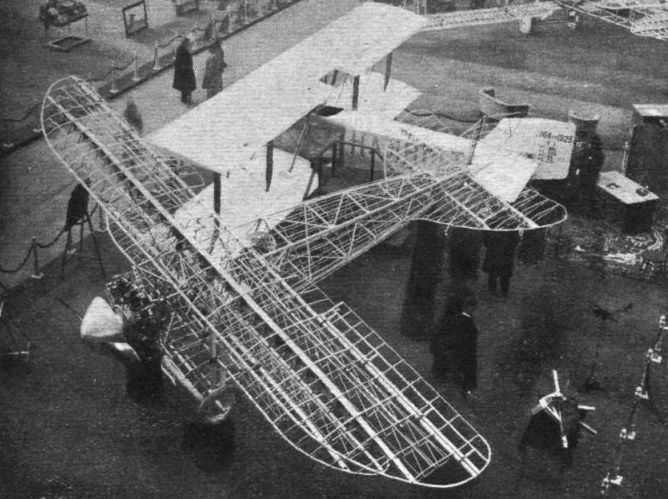 The principal characteristics of the'Hanriot H-D-26 are :- Span, 9 m. (29 ft. 6 ins. ); length, 7 m. (23 ft.); wing area, 18 m.2 (194 sq.ft. ); weight fully laden, 1,150 kg. (2535-75 lbs. ); weight per horse-power, 4-42 kg. (9-7 lbs. ); wing loading, 60-5 kg./m2. (12-4 lbs./sq. ft.). THE HANRIOT H-D-26 'SESQUIPLANE": A single-seater chaser of all-metal construction. The "plus fours" on the chassis struts are radiators. The Hanriot all-metal biplane: This view, taken from above, gives a good idea of the single-spar wing construction. Both in the fuselage and wings, channel section Duralumin is used extensively. SOME HANRIOT DETAILS: Fig. 1 shows a small portion of the lower plane, which is built up of channel-section ribs and stringers over rectangular section Duralumin tube spars. In the inset is shown the system of triangulation which takes the place of internal drag and torsion bracing. Fig. 2 shows the fuselage construction which is of channel-section Duralumin for longerons and triangulating struts. A number of light stringers are added to the main structure, as shown in the inset.